Oohs and ahhs ring out amid pops and booms as each blast lights up the evening sky. Our eyes eagerly turn upward anticipating the next colorful explosion. Choosing our favorite firework pattern or picnic food is on the agenda for most Americans this week. We have the freedom to choose many things in this country. Freedom of speech and religion are just two we’ll celebrate on Independence Day. I would argue, however, the best type of freedom we have is our God-given freedom of will. Sophomore year in college, I freely chose this topic for a final paper in bioethics class. I pontificated about the complex nature of free will for twenty pages and was so proud! Back then and still now, the topic intigues me. But looking back, I realize I didn’t have a clue to the magnificence of this gift. When God created the world, He gave Adam & Eve freedom to choose whatever they wished. They could eat from any tree, except one. We know their choice and we all have since suffered in sin. Eve freely chose not to obey God. Adam chose to agree with her. She could have chosen virtually anything yet chose the one thing she shouldn’t! Maybe like me, you’re a bit irritated at her. But as the thought crosses my mind I realize: I’m just like Eve. So, how will I choose to honor His gift of free will? God loves us enough to allow us to choose Him. He could have created us to automatically worship and love Him, but instead He gave us the choice. Eve and Adam made a bad choice. Sometimes, I do the same. But then I’m reminded of God’s love. Not only did He give us freedom to choose Him, but also Jesus to save us. Our eternal freedom has been won by Jesus’ sacrifice. He died so we may live and be free with God forever. He took the punishment for Adam and Eve’s and all our sinful choices. Our faith is a gift. We can choose live in the power of this saving grace because of the freedom of will God gave us. Dear friends, let’s not underestimate the power of this gracious gift! Our freedom to choose is originally and forever a gift from God. How wisely we choose to honor this with our lives is up to each of us. Let’s not only see what we don’t have but honor what we do. As we pause to recognize the wonderful freedoms of life, liberty and the pursuit of happiness, let’s keep going. Let’s thank God for the freedom to choose Him and to live our lives for Him. As we live for Him, we begin to experience our very purpose in this life. Now that’s truly worth celebrating! Thank you for revealing the roots of our spiritual family tree. Thanks Michele-yes it’s convicting, isn’t it? Thanks for stopping by and the comment! Happy Holiday weekend as we celebrate all our freedoms! Thanks Liz, I look forward to reading yours too! Thanks for stopping by and leaving your thoughts! Jill, this is beautiful! As I watched a fireworks display at a soccer game last week and listened to “I’m Proud to Be an American” I felt goosebumps just knowing I have the freedom to live for Jesus! I have the freedom to choose to live for him everyday. What a blessing. Loved this! Thanks Valerie! It is such a blessing & I’m so looking forward to celebrating it this weekend and everyday! “the best type of freedom we have is our God-given freedom of will.” Jill, this is not something I considered celebrating until now. I guess I see it as a battlefield. The things I want to do, I don’t; the things I don’t want to do, I do. But, praise God we have the choice and the power to choose good. Thank God for the righteousness of Christ and the power of the Holy Spirit in our lives! Thanks Kelly, agreed we surely have the best gift of freedom through Christ and the Holy Spirit’s guidance in our lives. Thanks for your comment and stopping by, always a pleasure to have you here. Age and experience are also teaching me to be more appreciative Jill. This is a great reminder to search out and be more observant of God’s graces so inturn, our heart and mind can be transformed. 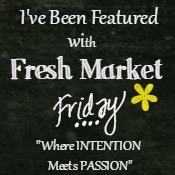 Thanks for sharing on Fresh Market Friday! You’re welcome, always a pleasure to link with you Crystal. Transformed hearts is what our freedom is all about! Thanks for your thoughts, I agree! Thanks Sarah-Glad I’m not alone in gaining wisdom with age! Let’s live and appreciate our God-given freedoms! Thanks for stopping by and sharing your thoughts. This is so good! Kingdom before County… I love the freedoms we have here in America and am as patriotic as the next gal, but it’s so important that we remember our Source of freedom and that there is nothing better than living in His Kingdom. Hope you had a great 4th! THanks Karrilee for your thoughts and stopping by-yes there is nothing better than living for our King! Had a great 4th, hope yours was wonderful as well, thanks again! What a wonderful thought that God loves us enough to “let us go” so to speak and allow us the choice whether or not to love Him. It makes me love Him more. Agree wholeheartedly, Edie! Thanks for sharing your thoughts!